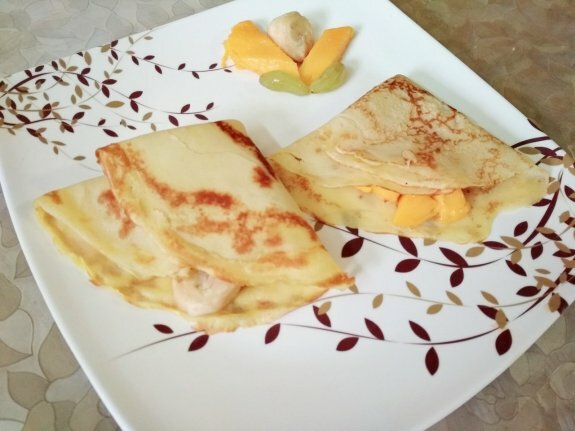 French Crepes are not so terribly fancy or intimidating but yes they must be thin and delicate pancakes that can be served with various types of fillings either sweet or savory or hot like with fruits including mango, banana, berries, chocolates, honey or may be with meats or cheese or vegetables as well. So, get the process of making this recipe from us and make it at your home. You can have this either as breakfast or as Brunch recipes during your holidays. 1. Take a big bowl and add flour, salt and sugar. Mix everything well. 2. Now in another bowl crack all the eggs . Now, add ½ cup of Milk, 1 tsp vanilla extract and whisk all together. Now add the flour mixture. Mix flour mixture with egg mixture properly. 3. Add melted butter and whisk again. 4. /heat a nonstick pan and grease with butter. Now add 2 Tbsp egg flour batter on the pan and spread it all over the pan as much as possible. Cook for 2 minutes and flip the other side carefully to cook the other side only for 30 seconds or until it is cook. 5. Now, remove from heat and serve it in a plate. Add filling as per your choice like mango pieces with some honey or banana slices with grapes and dust sugar etc.